Large parts of Ethiopia are rugged mountainous areas with deep gorges and rivers that swell to dangerous levels in the rainy season. Remote villages are then often cut off from their surroundings for long periods. 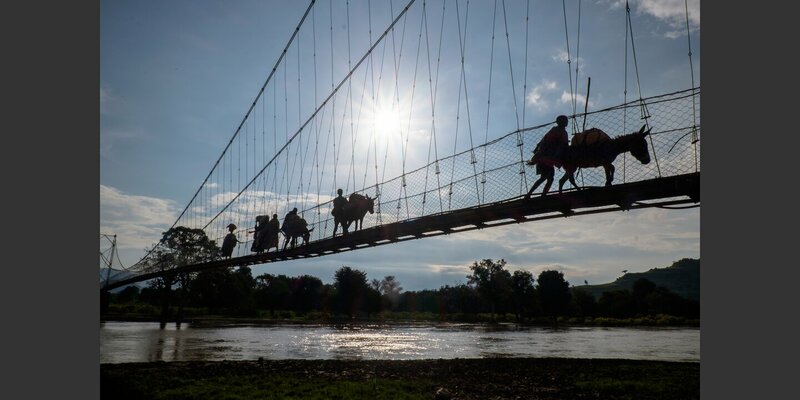 Helvetas’ suspension bridges are the population’s only weather-proof connection to schools, health centers and markets. Travelers in Ethiopia are often surprised to see how many people here get around by foot: children going to school, men and women going to markets, government offices or clinics. Many have to walk for hours just to reach a passable road. En route they often have to cross dangerous gorges, and many of the rivers are impassible in the rainy season. As in Nepal, Helvetas has provided support for the building of simple suspension footbridges in Ethiopia since 2004. The provincial authorities determine which villages and regions require bridges and cover 60% of the cost. The decision where to put a bridge takes into account technical aspects and planning issues as well as the needs, wishes and habits of the villages in question. The villagers help with construction. They dig the foundations, hew stones, pound gravel and gather sand. They form a long human chain to carry ropes weighing several tons to the site. In this way they make the new bridge their bridge. Each suspension bridge in Ethiopia benefits between 10,000 and 20,000 people, and costs over $50,000 to build. Approximately $20,000 of the cost is borne by Helvetas. Every year 10 to 15 new suspension bridges are opened here, and it is no coincidence that they resemble the 5,000 Helvetas suspension bridges in Nepal. The bridges in Ethiopia are constructed according to proven methods used in Nepal. Apart from some organizational tasks, it was exclusively Nepalese and Ethiopians who got the bridge-building program going in Ethiopia. And it was Nepalese engineers and technicians who trained their Ethiopian colleagues in bridge building in a two-year program in Ethiopia, which makes this an exemplary case of successful South-to-South know-how transfer.